From Passion to Profit? It Is Possible. About four years ago, I started writing articles to see if I would like this blogging thing. I started to write six months before posting a single article. Why did I write for months before publishing my first article? Fear. I was so worried that I even blogged anonymously for three years and struggled with the idea of revealing my identity, despite a lot of encouragement from my blogger friends at a yearly bloggers' conference I’ve attend for years now. That’s the thing about venturing out and turning a hobby into a business, be it on a an adhoc, part-time or full-time basis: it sends a message. It can also turn a hobby we enjoy into an obligation. And, as we can all appreciate, anything that becomes an obligation stops being fun. For context, I’ve enjoyed working out from the age of sixteen on. I had a weight set in my bedroom and a vision board filled with athletic role models. Then, when I was nineteen, my dad passed away or a heat attack at the age of 46. That made me even more convinced that physical activity and taking care of myself was a good idea. This journey lead me to more weight training, got me into running, lead me into gymnastics & bodybuilding and made me seek out classes of various types. The final push toward training others was when my mother had her first heart attack in her early fifties. That incident told me that I didn’t only want to take care of myself, but wanted to start helping others avoid chronic conditions, such as heart disease, obesity, diabetes, high blood pressure and the like. That was my “why” for enrolling into ISSA and completing their Personal Training certification. I then started to take on clients for one-on-one training in our home under the name Chrysalis Physiques. 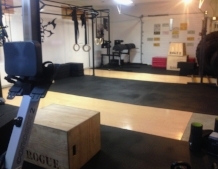 Shortly afterwards, I discovered CrossFit and both my husband and I became Level 1, then Level 2 certified and opened up an affiliate* by transforming our 3-car garage into a 900 sq ft facility and started offering classes five days a week. Other than my nearly thirteen years in the telecom sector, I have never done anything else of my choosing, career wise, that’s stuck for nearly a decade. I’m my own boss, I choose my own hours, and I still love what I do. And, given my lack of longevity in most pursuits (often by design), I wanted to really think about why it’s worked for me so well and for so long. On a related note, what also prompted this introspection and this article is that a fellow blogger expressed worry about turning a hobby or passion into a business on a message board for the upcoming bloggers’ conference I mentioned above. She worried it might kill the joy of it. As I didn’t think a message-board-length response would cut it, I’ve included my response to her question below, based on what I’ve learned so far. I love keeping my body strong but I also love helping others get the information and the training needed to pursue their physical and wellness goals. That means I like training myself, training others and training with others. I also love the sense of community a training environment can create. So my husband and I have done what feels appropriate to ensure we can do this for our members and ourselves. I think the insights I gained from our personal training business are helping me get the most out of this blogging experience (and its derivatives). I'm very comfortable with list. It makes sense to me and it helps me establish and maintain boundaries. After all, if I didn’t do the above, I wouldn’t be “free to pursue” now would I? If you were curious about turning an idea or a passion into a business you might enjoy over the long term without letting it wring the passion right out of you, I hope the above helped provide some answers. Now, what about you? Have you successfully (or not) turned a hobby into a business? How long have you been or were you in business and do you have any advice to share? *We were a CrossFit affiliate for four years until we realized it was too expensive for the little benefit it offered us as a small facility. **For any Canadian readers, this is the designation you should expect from your trainers/instructors. It makes a very big difference in their ability to properly scale and modify exercises for your needs. ***Our hope in volunteering our time doing this is that they’ll take something away they can use in their own fitness pursuits. After all, this business came about from my deep desire to help others in the pursuit of health and wellness. I’ve even had a few blogger friends, family members and former telecom colleagues join in…and some of them even chose to stick around.